Lassi is a yogurt based drink that is very popular in the Indian subcontinent. Lassi could be either savory or sweet. It is a blend of yogurt , water, spices and sometimes, fruit. Today, I will be sharing with you all a delicious recipe for SWEET LASSI. 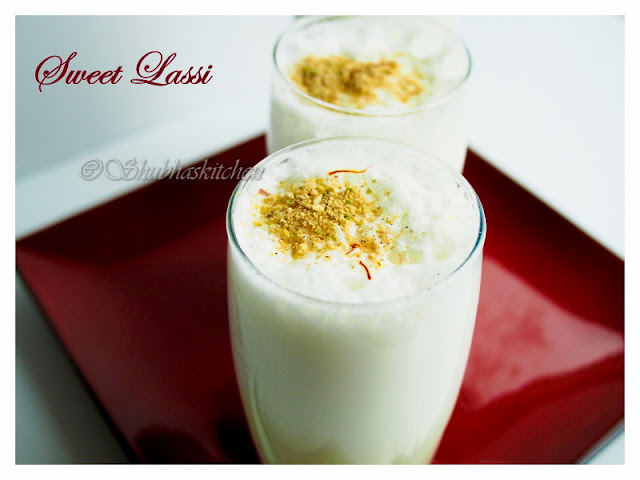 Sweet Lassi is very popular in Punjab. Do visit a Punjabi Dhaaba and order a Aloo parata and Lassi combo. Believe me, its a total bliss. 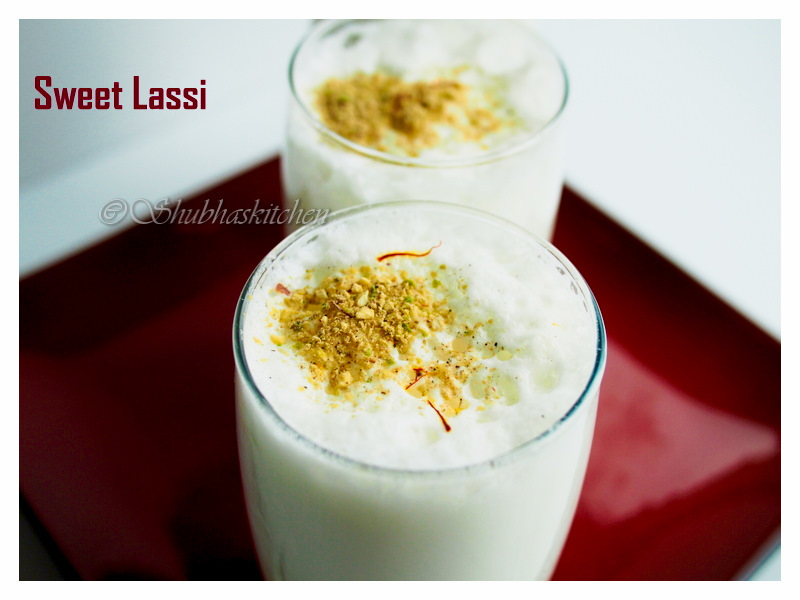 Punjabi sweet lassi is very thick and is topped with malai or cream. Traditionally, it is prepared by churning with a wooden whisk but it tastes equally good when prepared with a blender too. 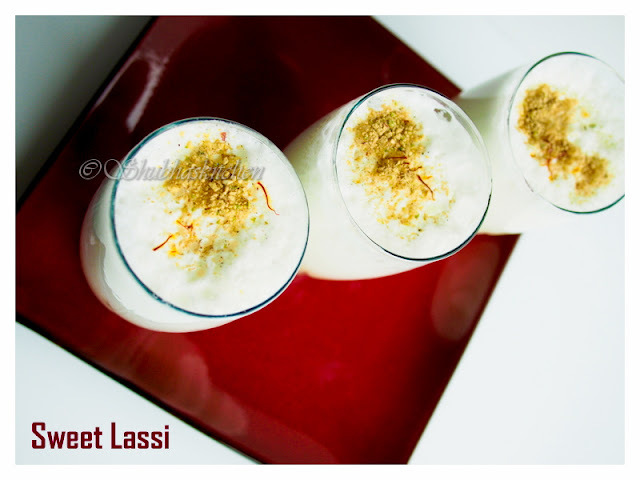 The Sweet Lassi recipe that I will be sharing today is much lighter and very easy to prepare too. Serve it chilled and you have a perfect refreshing drink for a hot summery day. Blend yogurt, milk (or water), sugar, saffron and cardamom powder in a blender . Take some ice cubes in two tall glasses. Pour the lassi in these two glasses. Garnish with crushed pistachios and almonds. Lassi looks very refreshing...I can finish it in one gulp!!...slurpp!! Refreshing & cool drink for hot summer. Beautiful pic. Wow..lovely lassi...reminded me of my childhood....and it looks so refreshing...I am drooling! This looks so lovely dear. I love the frothy top with a nutty crust and tinges of saffron. How supremely delicious your glasses of lassi look. Truly the pictures epitomise the hearty Punjabi drink totally. Loving it and so wishing to grab a glass from there. I love lassi. Very popular over here too. This is a loveable sweet lassi. Thank you. Gonna make. A classic cooling drink. and a great drink to end an meal after lunch or dinner. Loved the clicks and presentation.